When it comes to the creatures of Japanese mythology, everyone knows the strange and absurd monsters, from the kappa to the kasa-obake. 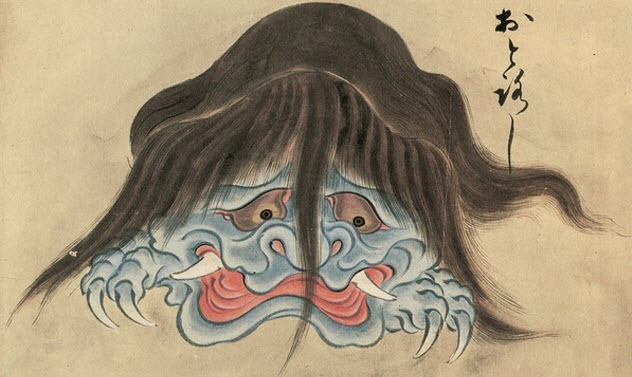 Japanese mythology has its fair share of weird monsters, and they’ve quickly become quite well-known worldwide. Behind these curious tales, however, lie a whole variety of murderous, deadly monsters that don’t quite make the tourist board. You always have to keep an eye out when walking along the beach. There might be glass or perhaps a beached jellyfish. However, there’s one more thing you may want to watch out for—the infamous “cow demon” that loves to terrorize fishermen. 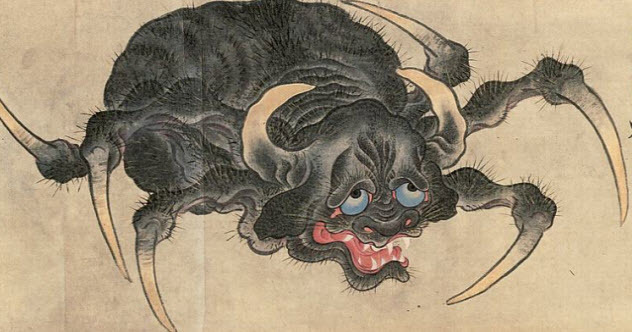 The ushi-oni (“cow demon” or “ox demon”) was a legendary monster that haunted Japan. 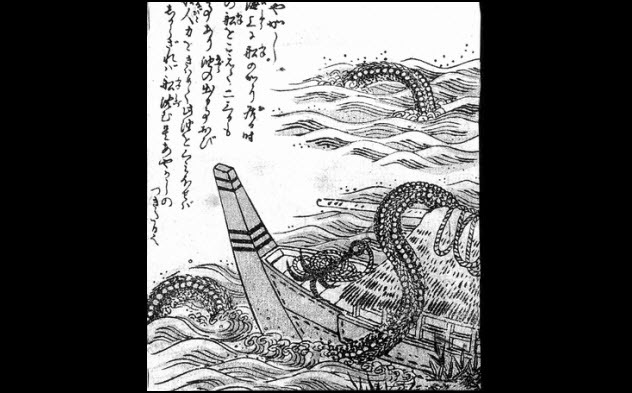 Working with the local nure-onna monsters, which were beasts with a woman’s head and a snake’s body, the ushi-oni ‘s favorite pastime was attacking fishermen. So you have an ox demon and a snake woman trying to kill you. Doesn’t make for a good day. Now that you know what an ushi-oni is, you need to know what one looks like in order to avoid them. But that’s where the real trouble comes in: Nobody can quite agree on what an ushi-oni looks like. Depending on where you are in Japan, you’ll be given a different description of this evil creature. Sometimes, it will have the body of a crab and the head of an ox, as found in the Shimane Prefecture. Sometimes, the body will be more spiderlike. Others believe that an ushi-oni is a very unfriendly cow. The Negoro-ji Temple in Kagawa depicts the creature with tusks and wings like a flying squirrel, while people in the Ehime Prefecture believe that it looks more like a Chinese dragon. If you want to see the Chinese dragon version of the ushi-oni, look no further than the Uwajima Ushi-Oni Matsuri Festival. During this festival, ushi-oni floats that are 6 meters (20 ft) high are carted through the town. There are also fireworks, dance displays, and bullfighting at the festival. It’s always a pain when you catch someone stealing things from your garden or yard. Next time it happens, remind yourself that it’s a lot better than a demon swooping down and kidnapping the women of the town to devour them. You can’t regrow those, after all. According to legend, Kyoto suffered this kind of predicament. 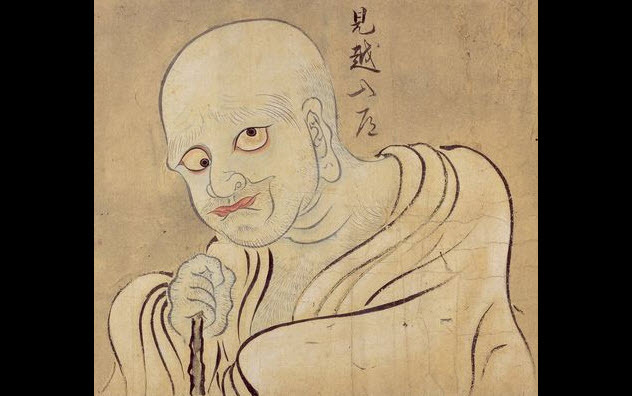 The great ogre Shuten Doji (“the drunken boy”) was luring women into his castle in the mountains so that he could imprison and devour them. Of course, no emperor worth his salt would sit around and watch this happen. So the Japanese emperor hired a samurai called Minaomoto “Raiko” Yorimitsu and five retainers to take out the troublesome beast. To avoid suspicion, they disguised themselves as Buddhist monks to hide their weapons and armor. On the way to the ogre’s castle, they were visited by three gods in human form, who gifted to Raiko an enchanted helmet and some sake that could induce heavy sleep. This came in handy when the group fooled the beast with their disguises and infiltrated the ogre’s keep, where Raiko offered some of the sake to the creature in hopes of slaying it while it slept. But it wasn’t that easy. 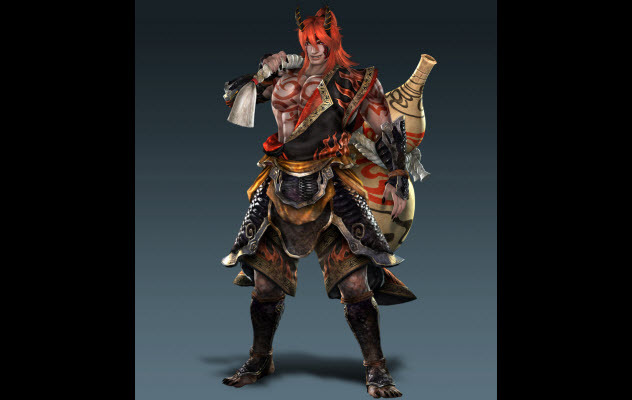 Shuten Doji would turn into a wicked red demon when served sake, and even if the ogre was beheaded, its head could live on to seek revenge. Protecting himself with the helmet he had just received, Raiko defeated the demon and brought it back to Kyoto. Just because a beast pounces on people and devours them alive doesn’t necessarily mean it’s evil. Take the otoroshi, for instance, a sort of demonic vigilante used to scare sense into children. The otoroshi (also known as the odoro-odoro or odoro-gami) liked to make its home within Japanese shrines. If you’ve seen a few of the shrines, you’ve probably noticed the torii, large wooden gates around the entrance that separate the mundane from the spiritual. These creatures, long and hairy with tusks, waited atop these gates to pounce upon people to eat. The twist? They only devoured bad people. Anyone visiting the shrine for legitimate purposes was spared, but those with evil in their hearts met a grisly end. If you have to convince people to do good, it seems that threatening them with giant hairy monsters is the best method. The Ikuchi belongs to a special brand of demon called the ayakashi. This is a monster that appears above the surface of the sea. Why is this important? Because Japanese demons like to reside on the borders of things, where one thing transforms into another, and ayakashi are believed to be the monsters that border the sea and the air. The Ikuchi drips oil from its body, coating the boats that are trying to sail past it. If the sailors clean the oil off the boat, they’ll survive. Otherwise, the boat will sink. Not all monsters initially appear as beasts. Some of them have the knack of appearing as if they were human right up until it’s too late. The mikoshi-nyudo’s name translates as “anticipating priest” because this demon takes the form of a wandering priest that travels mostly at night. He frequents quiet areas, where he can steal a human meal without much trouble. When encountering a mikoshi-nyudo, you’ll have a fair amount of warning that something is wrong before he tries to attack. After you look into his eyes, his neck will grow abnormally long. He wants you to follow his ascent with your gaze: The higher you stare, the higher he gets. Eventually, he’ll become so tall that you’ll fall over backward as you look at him. At that point, he’ll attack with his teeth and claws. If you try to walk off, he’ll stab you with bamboo spears. Thankfully, these guys have one major problem. They don’t like it when you won’t play ball. How you go about this is uncertain. Some say that you simply make direct eye contact, and when the mikoshi-nyudo ‘s head begins to ascend, you look downward toward his feet. Others state that the way to defeat him is to say mikoshita (“I see higher“), which also causes him to vanish. Sometimes, you just can’t overcome monsters with smarts alone. You may be sailing around with extra oil cleaners and making sure you’re on your best behavior when you visit temples, but nothing can prepare you for an attack from a 27-meter-tall (90 ft) skeleton. It just sort of happens. They’re not friendly, that’s for certain. 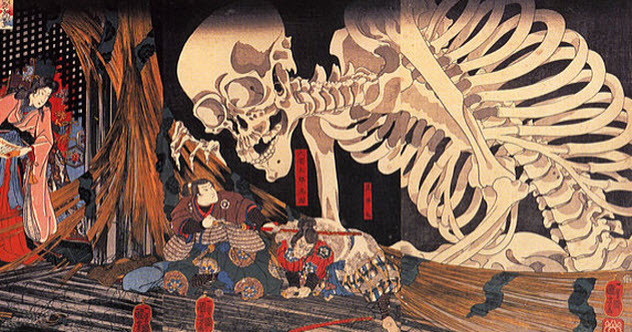 The vast skeletal body of the gashadokuro (also known as an odokuro) is comprised of the bones of people who have died either from starvation or warfare, so the monster probably won’t be in the best of spirits. In fact, if the deceased weren’t buried properly, their spirits are exactly what cause the problem. When 100 angry souls seek vengeance together over their corpses being left to rot on a battlefield, a gashadokuro is born. So what does a giant skeleton do? The only thing giant skeletons can do: chase down stray humans with great persistence, catch them, and devour their skin, organs, and blood before sticking their bones onto itself to become even bigger. Riddles or tricks won’t save you. The only way to kill a gashadokuro is to make him run out of energy before he gets you. Once all the vengeful energies that created him peter out, he’ll collapse. Until then, you have a few ways to avoid a nasty fate. The first is to make sure that he never sees you, which means listening for him. Different accounts state that you’ll hear ringing in your ears or the rattling of his bones when this monster is close to you. He vanishes during the day, so hiding out until sunrise is a good idea. Just remember that a gashadokuro can partially disassemble itself to get into smaller places. Also, not prodding around recent battlegrounds would be a good idea, but you didn’t need us to tell you that. 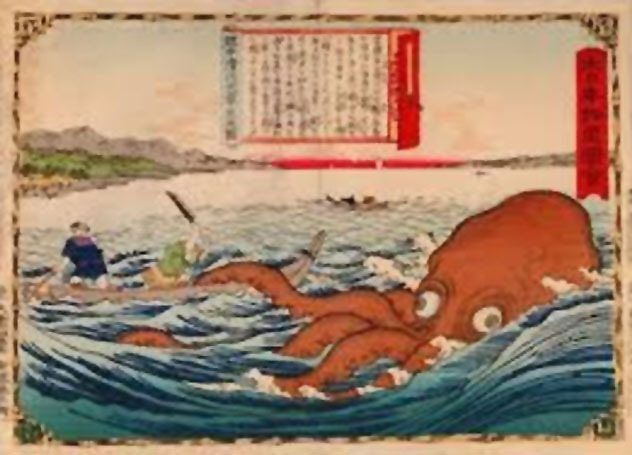 Much like other cultures have Bigfoot or the Loch Ness monster, Japan has the cryptid Akkorokamui, which takes the form of a 110-meter-long (360 ft) octopus. Unlike some of his international friends, the Akkorokamui is definitely a malicious beast. In the early 1900s, the Ainu, an indigenous group of Japanese people, claimed that the beast attacked three fishermen catching swordfish and emitted a nasty fluid that stank. For that reason, the Ainu always carried weapons on their boats. That way, they could fend off any attacks from the nasty octopus. Even today, some people claim that the huge octopus is alive and well. Thankfully, given its brilliant red color and vast size, you’ll definitely see it approaching long before it reaches you. So if you feel like bringing a myth into reality, take a look around its home—the waters of Funka Bay—and try to catch the biggest haul in human history. In a traditional tale, the Yamata-no-Orochi was a dragon with eight heads, eight tails, and a body long enough to cover eight peaks and valleys. It also presumably couldn’t count to nine. 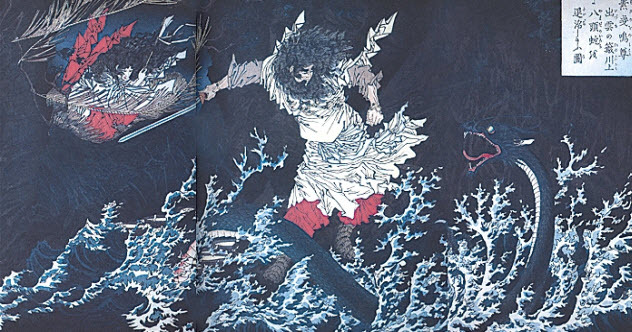 The tale begins with Susanoo, the Japanese storm god. He was a bit of a troublemaker, probably because he was created from the dripping snot of the creator god Izanagi, which would tick anyone off. After causing problems in the heavenly planes, Susanoo was thrown out of heaven and had to stay on Earth for a bit, the divine equivalent of having to sleep on the couch. While wondering what to do, Susanoo encountered an elderly couple and their daughter crying by a river. Every year, the ferocious Yamata-no-Orochi devoured one of the family’s daughters, and this year, the last remaining daughter would be its snack. Susanoo agreed to help the family in exchange for the daughter’s hand in marriage. The plan was relatively simple. The elderly couple built a large fence with eight gates, one for each head of the dragon, around the family’s house. Just inside each gate, a vat of strong sake was placed on a platform to lure the dragon to drink with each of its heads. In Japanese folklore, monsters love sake. When the dragon finally came to visit, it found the sake and drank deeply with all of its heads. The dragon became so drunk that it passed out, allowing Susanoo to slice the evil monster into pieces. Susanoo was so pleased with himself that he built a palace in Suga for himself and his new wife to live in. Some monsters don’t have to be huge and terrifying to be deadly. In fact, if you let a pig run through your legs, there’s a chance that it’ll be the last thing you ever see. The katakirauwa is probably one of the more swift and efficient monsters in Japanese mythology. It has the form of a pig, either an adult pig or a piglet. Its method of attack is quite simple. It senses if there are any people around it that are currently alone. When it finds someone, it makes a mad dash for them. It may not have any formidable claws or teeth with which to attack, but it does have one special ability: If it runs between the legs of a passerby, it instantly drains that person of his soul, leaving the victim as a shell of his former self. There are a few telltale traits of this demonic pig that will tip you off that it’s a malevolent being. 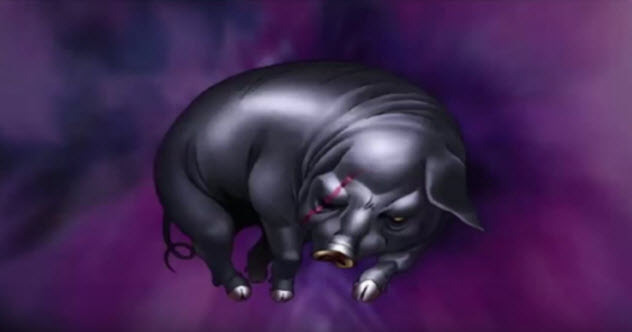 Not only does the pig lack an ear but it also doesn’t cast a shadow. Depending on which region of Japan you’re in, their various mythological monsters will have different attitudes and personalities. A kindhearted being in one area may be a vicious ghost in another. Following this pattern, the Yuki Onna (“snow woman”) may take a different form depending on where you are in Japan. Some of the basics stay the same just about everywhere. The Yuki Onna usually has snow-white skin and wears a white kimono. Sometimes she has black hair and other times, white. Usually, she is depicted as a stunning beauty. 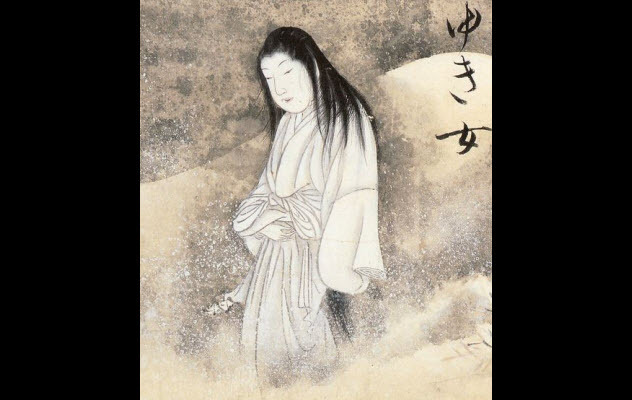 The first record of the Yuki Onna tells the story of a 3-meter-tall (10 ft) lady who vanishes into the snow as soon as someone speaks to her. Other tales depict a woman who asks for hot or cold water. Cold water causes her to swell up, and hot water makes her melt. Another tale portrays her as a princess who lived on the Moon, which was so boring that she decided to pay a visit to Earth before she got stuck and couldn’t return home. But her tales aren’t all benign. In some places, she can be a wicked force of death. In one version of her story, she’s a vampire who enjoys freezing her victims in ice and then extracting the souls from their bodies. In another, she tries to engage her victims in conversation and attacks when they reply. In yet another, she attacks if the person doesn’t reply. As someone may not know beforehand what triggers an attack, it makes things extra interesting when she’s encountered. S.E. Batt is a freelance writer and author. He enjoys a good keyboard, cats, and tea, even though the three of them never blend well together. You can follow his antics over at @Simon_Batt or his fiction website, www.sebatt.com.